I haven't had much time for reviews this past week. Both kids have been sick, and I've also volunteered to help coordinate our elementary school science fair so I've been working on writing up forms and keeping a spreadsheet of participants. Lots of busy work, but I can't wait to see what kind of science experiments and inventions the kids come up with to display. The Chicago Museum of Science and Industry has a fun, informational website. 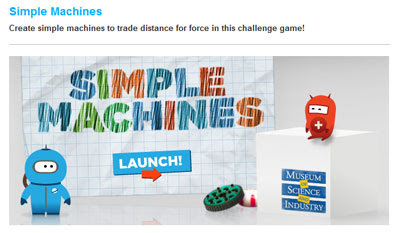 I recently noticed they added a fun game about simple machines. Kids can help a cute little robot dude named "Twitch" use simple machines to solve problems and collect parts. Kids learn about the following simple machines: inclined plane, lever, wheel and axle, and pulley. My preschool daughter and I played the game together. Young kids will need assistance playing. The graphics in the game are fantastic and the game doesn't take overly long to play. We tried to use the least amount of force possible and scored 267 points. Can anyone beat us? Sounds like a lot of fun. I love it when museums have this interactive approach! Makes kids so much interesting in the subject than when reciting pieces of information they'll forget in the blink of an eye. This must be a real booster for the kids.